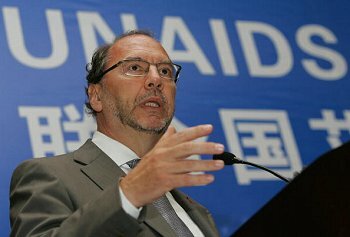 Peter Piot, the longtime head of the United Nations agency coordinating the global response against H.I.V./AIDS, completed his 13-year tenure on January 1, 2009. His departure from UNAIDS marks the end of an era wherein former researchers and scientists that worked in Africa during the earliest days of the AIDS epidemic came to prominence as international health policy makers. He was replaced by his former deputy Michel Sidibé, who emerged as executive director after an open search process by the UNAIDS Program Coordinating Board. Dr. Piot, 59, a native of Belgium, joined the World Health Organization (W.H.O.) Global Programme on AIDS in 1992 as associate director. I first made his acquaintance in the company of Dr. Jonathan Mann, former director of the W.H.O. AIDS program and Piot's colleague during their groundbreaking work on AIDS in Africa. In those days, he was a remarkably quiet man with a dry wit. However, his impressive credentials were already evident as the co-discoverer of the Ebola virus, an accomplished physician, a skilled epidemiologist and a notable virologist. He had also co-launched a series of H.I.V./AIDS collaborative projects in Africa, including successful programs in Zaire, Kenya, Tanzania and Burundi, among other countries. Not yet evident in those nascent days of the global response to H.I.V./AIDS was the health pioneer's strong political, organizing and advocacy skills. By the time Piot was appointed UNAIDS' executive director, he had to deal with the delicate creation of the new organization from the powerful grip of the W.H.O. and other UN agencies. He skillfully executed the separation from the W.H.O., then began the process of building an organization with the major mandate of mobilizing the response of the UN system and the international community to H.I.V./AIDS. Today, UNAIDS is well known and respected worldwide for its technical competence and mobilization skills. In those early days, the ultimate success of the agency was not assured. In an electrifying farewell speech at the Center for Strategic and International Studies in late October 2008, Piot described the state of global response to H.I.V./AIDS in 1995 when he assumed office. A total of $250 million was spent on AIDS in low- and middle-income countries; no one was creating antiretroviral therapy programs in the developing world; only two countries recorded modest declines in new infections in 1996, Uganda and Thailand; only three countries in the world (Uganda, Thailand and Senegal) had demonstrable political leadership on AIDS; ministries of health were the only government agencies involved in the fight against AIDS; civil society organizations in the developing world were not actively engaged in the fight against the syndrome; UN agencies were not working together on H.I.V./AIDS; and public stigma and discrimination against people living with H.I.V./AIDS was the norm rather than the exception. The fight against H.I.V./AIDS has come a long way. At least $10 billion was spent on combating its worldwide effects in 2007. More than three million people are now on antiretroviral therapy. Over 40 countries have their president, deputy president or prime minister directing a national response to AIDS. Civil society remains indispensable in the fight against the pandemic. International, national and local public/private/civil society efforts have drastically reduced stigma and discrimination against individuals living with the disease. Although Piot and UNAIDS will be the first to disavow singular credit for all significant progress made in the global fight against AIDS during the last decade, there is no doubt that he and his team were in the driver’s seat during the noted period. In his October 2008 speech, Piot indicated that he had three major goals on assumption of office — first, put AIDS on the global agenda; second, build a formidable alliance against H.I.V./AIDS; and third, mobilize money to fight AIDS. On these stated goals, expectations were widely exceeded. Some of Piot’s finest hours as the executive director of UNAIDS involved his strong leadership on negotiating lower prices for antiretroviral drugs with the pharmaceutical industry; the organization of the first ever UN General Assembly session on H.I.V./AIDS; his bulldog stand against any form of stigma and discrimination against individuals living with or affected by H.I.V./AIDS; and his courageous insistence that billions (not millions) of dollars should be devoted to the fight against the disease worldwide during the time when financial support was elusive. Piot combined his unmatched mastery of the science of H.I.V./AIDS with his strong analytical and writing skills to become a powerful global ambassador of against the spread of the pandemic. His strong support for action on the developmental consequences of H.I.V./AIDS made him a primary advocate for global health. He was among the first senior international health policy makers to recognize the nexus between the fight against H.I.V./AIDS and the wider battle against poverty and underdevelopment. Unlike accomplished field researchers and scientists, he sought a wider circle of partners and stakeholders. Piot was particularly comfortable with civil society organizations. He reached out and supported individuals and organizations working on H.I.V./AIDS advocacy in every part of the world. I remember how he reached out to the Constituency for Africa in Washington during its push for the Global AIDS Trust Fund that was passed by Congress and signed into law in 2000 by President Clinton. As in all brilliant careers, there were missteps. His ill-fated run for the leadership of the W.H.O. was puzzling to his friends and admirers. The controversy over the global estimates of H.I.V./AIDS statistics could have been handled better. The inability to have a consolidated UN system-wide H.I.V./AIDS operational program on the ground in resource-challenged environments is still surprising. The relationship between UNAIDS, the W.H.O. and the Global Fund against AIDS, Tuberculosis and Malaria is still tentative. Finally, the youth and individuals living with H.I.V./AIDS did not become full, indispensable partners in the fight against the pandemic. Dr. Peter Piot deserves acclaim for his indefatigable and brilliant leadership of the global fight against H.I.V./AIDS. As he moves forward in his career at the helm of the new Institute for Global Health at the Imperial College, London, Piot has set a very high standard for international public service. In the last decade, he had been a pre-eminent global health diplomat. Despite a very busy job at the helm of UNAIDS he never lost touch with his earlier career as an academic, authoring 16 books and more than 500 scientific articles. He is a member of the prestigious Institute of Medicine, a Fellow of the venerable Royal College of Physicians, and was knighted as a Baron by King Albert II of Belgium in 1995.